Tie dyeing is a lot of fun. 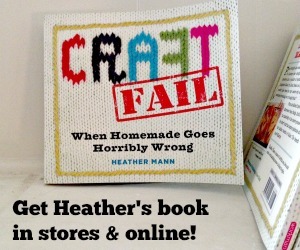 In fact, it is one of the first crafts I spent a chunk of time and money on as an adult. Back in the late 90s, I went through a tie dyeing phase, and I produced about 25 tie dyed t-shirts. My poor husband was then stuck wearing tie dye for the next ten years! I tie dyed so much that time, that I have not picked up the tie dye since. It seemed like such a big process: soak this, mix that, protect this, rinse that, clean up a big mess. I didn’t have the heart to try it again because I was afraid of the commitment. Well, I recently got a chance to try out a tie dye kit that completely changed my views on tie dyeing. 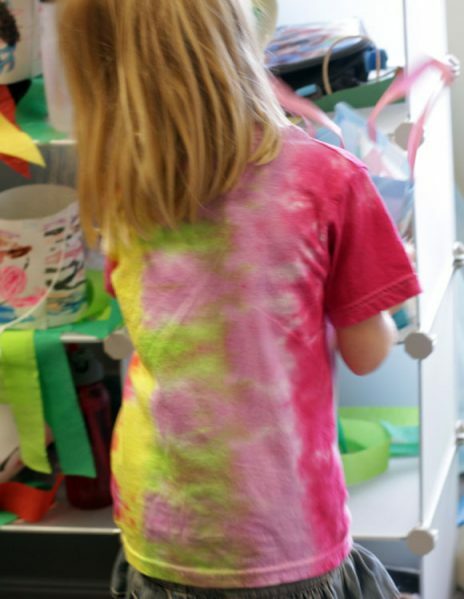 In fact, I had so much fun with the kit, that I volunteered to make tie dye shirts with my son’s preschool class at the end of the school year. And you KNOW you don’t volunteer to do something as messy as dyeing shirts with 4 year-olds unless you are really convinced it will be easy! 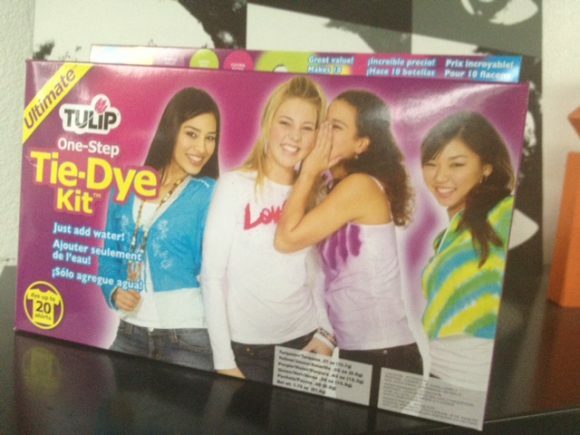 The kit that changed my views on tie dye was the Tulip One-Step Tie-Dye Kit. I can wholeheartedly recommend this kit as the easiest way to tie dye, ever. It comes with everything you need, including squeeze bottles (pre-filled with dye powder), rubber bands, gloves, and instructions. Tulip did not ask me to post about their kit, but I love it so much that I asked them if I could have some kits to give away. I have also purchased additional kits, and told all my parent and teacher friends about this product because it is so much fun and so easy to use. How it differs from traditional tie dye: Unlike with traditional tie dye, you don’t have to pre-soak garments in a chemical solution, or mix up a complicated recipe for the dye. You just add water to dye bottles, shake, and go. All the supplies you need to complete the project (except the t-shirt) is in the kit. The One-Step Tie-Dye kits come in all different price ranges. This one here retails for about $20 (which means you can get it with a 40% off coupon – bringing it down to about $12! ), which is just a smokin’ deal for all the dye you need for making up to 20 t-shirts. You can also get a smaller kit (with enough for up to 8 shirts), for less than $10, or even single bottles of whatever dye colors you want. You can dye clothes you already have on hand, or frequently find 100% cotton t-shirts at the dollar store. The dollar store also has cotton flour sack towels and cotton crocheted doilies, which are all great for dyeing. 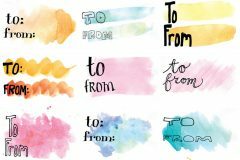 In this article, I have written down all my tips for tie dyeing with children, from ages 2 and up. These tips will help you whether you have one child or thirty. 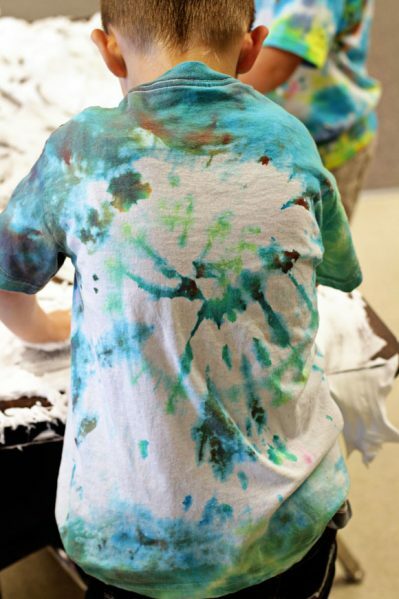 You can tie dye in classrooms, scout groups, at parties, day camp, or just for fun. The Tulip One-Step Tie-Dye kit is the way to go when tie-dyeing with kids. 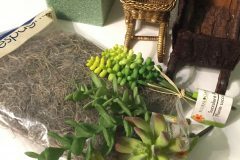 It already contains some supplies, but you can also find extra supplies at the dollar store that will help the process of dyeing with kids go even smoother. 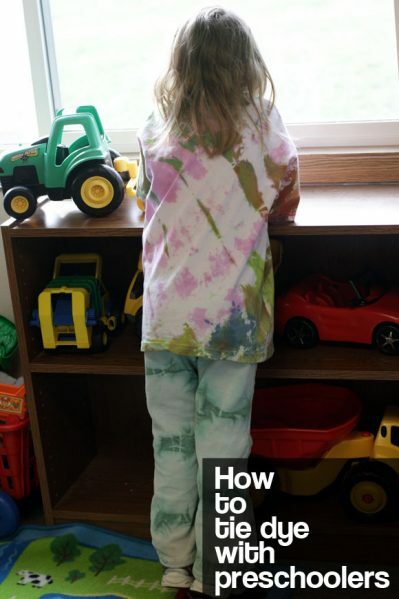 In tie dyeing with my own kids, I came up with some techniques that keep the project from getting TOO messy, even with kids as young as 2 (as my youngest son is). Tshirts: You can sometimes find white 100% cotton t-shirts at the dollar store. In my town, only one Dollar Tree had them. I usually stock up on t-shirts when I see them at my store. You can also get 6-packs of undershirts at your local department store. Buy a size or two larger than your child is, because tie dye shirts look best when they are oversized. You can also find an assortment of white clothing blanks at Dharma Trading – I highly recommend them for a huge selection of items (including circle scarves which are a fun item for adult tie dye parties). Rubber bands or zip ties: You probably have rubber bands on hand (and the kit contains some bands), but did you know that zip ties make a much cleaner line? If you are aiming for some semblance of perfection, go with the zip ties. And also, be warned that there is no such thing as predictability with tie dye! 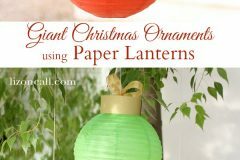 Plastic tablecloth: You can reuse an old one, or buy one from the party section at the dollar store. Or, you can cover your surface with trash bags or a tarp. Disposable metal roasting pan: This is a key ingredient in keeping the mess contained when tie dyeing with children. If you don’t want to buy a disposable pan, you can also use a shallow cardboard box and line it with a plastic trash bag (completely covering the entire box), OR a plastic shoebox. Do not use a cooking pan for tie dye, or you will not be able to use it for food again. Gloves: The kit comes with a few pairs of those sandwich bag-style plastic gloves, but you can buy another box of plastic or rubber gloves at the dollar store if you will have more than a few participants. I recommend using a sturdy pair of dishwashing gloves for the person who is running the show and will be handling all the tie dyed garments. Your clean, unstained hands will thank me. Zip-top bags: This is the easiest way to contain the individual shirts while they are waiting to be rinsed, and it keeps the dye from seeping out during the waiting period. If you will be sending the shirt home with the child, pre-write the child’s name on the outside of the zip-top bag for easy identification. For children’s shirts, a quart-sized bag will be big enough, but for adult shirts, you will want gallon sized bags. Permanent marker: Write each child’s name on the inside collar of the shirt before dyeing. Then you will be able to match the right shirt to the right kid after they are finished. Table: Dyeing on a table is FAR easier than dyeing on the ground (say, on a tarp on the grass). Trust me, I tried both ways, and the outside on the ground method was CRAZY. 1. Cover table with disposable plastic tablecloth. 2. Put out metal roasting pans on protected table to make two “stations” for tie dyeing. Make sure child puts gloves on before she begins to dye. 3. You might want to have paper towels nearby for quick clean up. 4. Pre-fill and mix squirt bottles with dye. 5. Before you begin, let an adult pre-rubber band (and label) the shirts. Most preschoolers don’t know how to use rubber bands yet, anyway. 6. You should pre-wash the shirts before you begin the project as unwashed shirts won’t take the dye as well as a washed shirt. Before dyeing, pre-soak the t-shirts in water and wring out to avoid dye puddling. Dye soaks into a wet shirt more easily. In an ideal group dyeing situation, you have 2 or 3 adults helping with the tie-dye project (especially if there are more than a few kids). 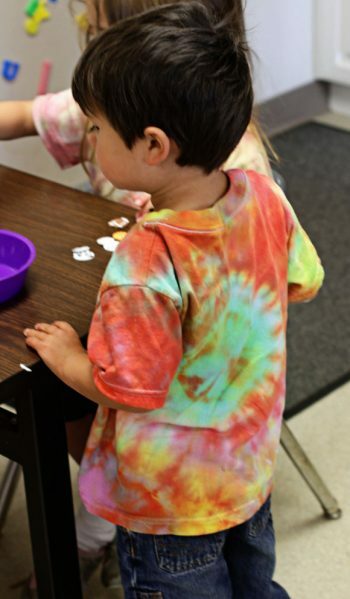 I had no trouble tie-dyeing alone with my three kids, but having three adults was necessary when I tie-dyed with my son’s preschool class of 25 kids. If you don’t have enough adults, consider drafting an older child to help. 1 person will help prepare the child (putting on aprons and rubber gloves, guiding the child away after she is finished), and assist the tie dye table, mixing additional dye, etc. 1 person will watch all the kids who aren’t tie dyeing at the moment! 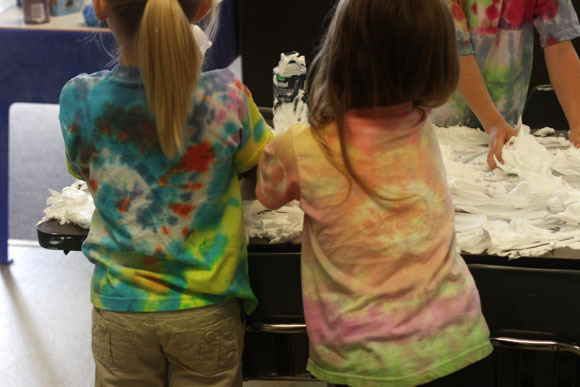 For best results, limit the tie dye stations to 2-4 children at the most. In other words, don’t try to oversee more than 4 children at a table at once. You must have gloves and an apron on before you start. Only one color of dye at a time. Keep your shirt inside the pan. Only squirt dye onto the shirt inside the pan. No dye squirting outside the pan. Dye is a very special kind of paint, and it is very hard to wash off, so we have to be careful where we put it. 2. Keep your eye on each child to determine when he has used enough dye. The shirt should be somewhat saturated, but not dripping with dye. Some children need a “one more color” warning before they finish. 3. When child is finished, put her t-shirt in a labeled zip-top bag and seal. 4. Have child remove gloves directly into the trash can, and remove apron/smock. Check apron for wet dye before passing to the next child. 5. Send child to hand-washing station, and then they’re done. 6. Wipe up child’s area of any excess dye, wipe pan out. If you are sending the t-shirts home with the children, label the bags with “rinse me out tomorrow morning until water runs clear, then wash in washing machine with detergent and dry as normal.” You might want to pre-print labels if you have a lot of kids. If you are taking them home to wash out yourself, just let them sit for 12-24 hours and then rinse and launder as instructed on the box. One 20-person kit was more than enough for my son’s preschool class. Remember, you will have to mix additional dye as you go. The 20-shirt kit comes with additional packets of dye. I tried to write down as much info as I could to help people who want to organize a tie-dye party. The main things to remember: get the kit, protect your surfaces (and your kids), and have fun! That is amazing. There should be some sort of medal for tie-dying with that many kids. Thank you so much for your dying tips. 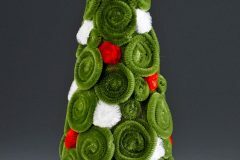 I will be tie dying with a group of kids in a few days and I hadn’t done any dying for over thirty years and knew that Tulip had made a much easier way. I went to several sites before encountering yours and there sites did not offer much help. I almost gave up and figured I could get more info off the Tulip packaging than I was getting on the net. THANK YOU SO MUCH FOR THE INFO AND TIPS. I think I can handle it now. May you be blessed this day in unexpected ways. What a wonderful post, Heather ~ my youngest loves to do projects with me and he will have so much fun with the tie dye! Is the dye in the tulip kit toxic or poisonous? Thank you so much for such a detailed tutorial. I was just wondering, can I rinse the t-shirts and dry them in the dryer as soon as the kids are finished? I am throwing a tie dye party for my daughter’s 6th birthday and would like the kids to take the shirt home with them as parting gifts. what do you think? @Rosa, I would let them sit for awhile before drying. Maybe send them home in a ziptop baggie with instructions to wash in 12 hours?